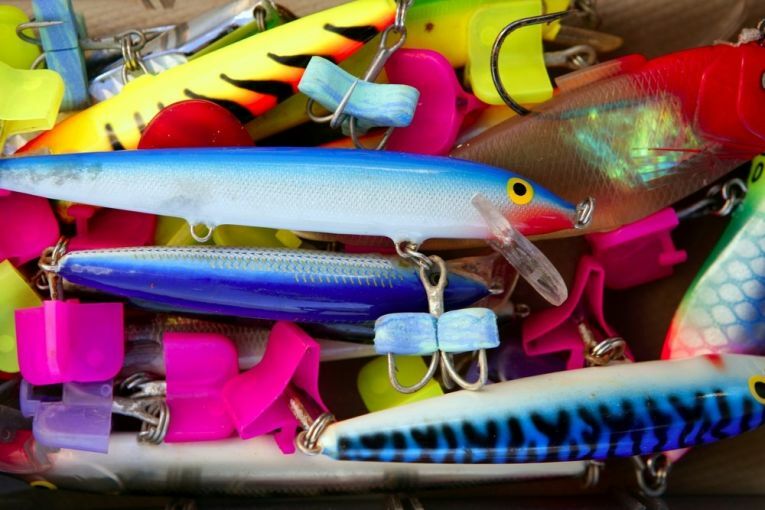 →What Are The Best Lures For Saltwater Fishing? You’re standing on the beach, seaspray and wind in your face, holding the rod and looking hopefully into the water— but the fish aren’t biting! As awful as it is to be out of luck, there are always solutions. I will help you understand the basics of fishing lures and how to pick one. After reading, you will be able to decide what the best saltwater fishing lures are. Read on and up your game! At first sight, the different types of lures for saltwater fishing seem so varied they might overwhelm you. Worry not, I’ve got your back! Fishing lures are artificial baits: they work by making the fish believe they are its real food. The lure is attached to the rod and line, and usually includes a hook to trap the fish when it bites. Spoon fishing lures: As you can guess from their name, these lures look somewhat like a metallic spoon. They’re designed to move and shimmer like a swimming fish. Their size and shape depend on whether they’re meant for casting (heavier, so they can be thrown) or trolling (generally lighter). Surface lures, such as poppers: These lures glide across the surface of the water, splashing and making “pop” noises to attract predator fish. Plug lures: Similar to poppers, but “swimming” underwater instead of gliding on the surface. The movement of the lure is what draws the catch in. Jigging lures: These items consist of a weighted hook and a trailing section that looks— to the fish— like something edible (think worms, insects, squids, etc.). They come in very different materials and looks, which are meant for separate uses: heavy rubber for bottom fishing, metal for fast casting and retrieving, etc. Bucktail jigs: These jigs are so successful they deserve special mention. They have a skirt of varying length, which can be made of hair, plastic, feather, or rubber. They work because the movement of the skirt in the water imitates bait fish. Soft plastic lures: Also called plastic swimmers, they are soft, colorful and resemble prey animals. They are practical and easy to cast out. Spinnerbaits: This kind of lure is a bent wire with a hook and a spinning reel section. Spinnerbait lures are unique in that they appeal to fish because of their movement and sound, instead of looking like bait. The best saltwater lures for surf fishing: Surf fishing is, essentially, standing on the beach or low water and casting the line into the surf. The best lures for surf fishing are poppers (use at twilight by splashing across the surface), casting spoons (as they are heavy, they can be easily thrown into the coming waves), and plastic swimmers (surf fish are especially attracted to anything that looks like food). The best lures for inshore saltwater fishing: This type of fishing— wading or sailing in a small boat along shallow waters— favors bucktail jigs, as they resemble bait fish that live in this area when they’re submerged and moving. Spinnerbaits are also successful: in water that may be murky because of sand or soil, their movement and sound make them a good option. The best saltwater trolling lures: When trolling, you don’t just need a great motor: you also need the right lure to trail behind your moving boat. Plugs, because of their slow underwater swimming, will successfully imitate attractive bait. Trolling spoons are also good: their shape, weight, and shine will make them alluring when trailed. 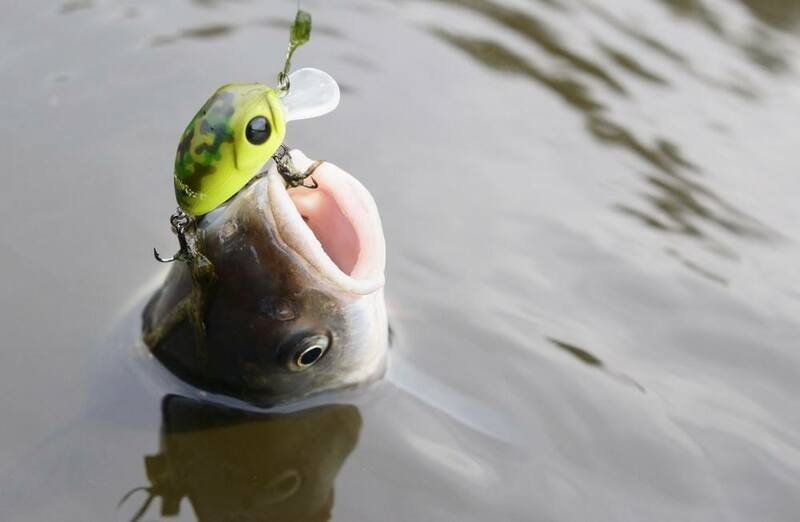 Different types of lures will attract different fish. Think of the favorite food of your chosen catch. It’s well known, for example, that bass fish love bucktail jigs, and that crevalle jack will go crazy for a popper! The appeal of the lure to the fish is in how closely it resembles what the fish would normally want to eat. You might be wondering, then, what the perfect fishing lure color is. It’s a good question, as most fish are able to see colors, with day-feeding species being best at it. So, if you’re fishing at twilight or nighttime, you can’t go wrong with shiny or fluorescent lures. But, if it’s daytime, the perfect lure colors are light, such as chartreuse, white and gold. Besides light quality (whether it’s daytime, twilight, or night), there are other factors that can affect your lure choices. The quality of the water— whether it’s murky or clear— makes a big difference in the fish’s ability to see what you’re throwing at them. If the water’s murky, you’ll want to use solid, darker lures in neutral-looking colors. On the other hand, if it’s clear, you’ll fare better with lures that look like the real thing: think plastic swimmers or painted metal jigs. Finally, consider the season: there’ll be different species in the same area, as the seasons change. And different species often mean different lures! If you fish regularly (or even sporadically! ), chances are, you enjoy the activity. Part of this is probably because it can be quite relaxing— meditative, even. However, if you start fretting too much about what lure to use to maximize your odds of catching fish, you’ll likely stop enjoying it. The best thing you can do is learn what the best types of lures are, consider your fishing location, your desired quarry and its proclivities, and your environment. If you go through these steps and make sure you are stocked with the best saltwater fishing lures, your experience will most likely be fun. So, brush up on that knowledge, and good catch!